worked with us as a family"
Here are a selection of testimonials from parents whose children have participated in our specialised programmes at The Child Development Centre. Maria’s mum talks about how Maria’s tentative diagnosis of ASD effected the family, and the describes the immediate positive impact felt after their first LiFT session. “It’s a bit of a story of how I stumbled across our Fairy Godmother, but it was one of the only meetings with a professional that gave us hope. The doctors and speech therapists were quite frankly, useless. One exception, Dr. Goodwin McDonnell, a great man, who handed me Karen’s book whenever he first examined our daughter and told me “the music is the key”. I read Karen’s book – I had to meet this women – my daughter had to meet this women. I recall our first meeting. After assessing our daughter for a couple of hours, Karen told me that she did not believe that she was autistic, but that she needed immediate treatment. We commenced the LiFT Programme followed by the booster. Coming from a medical family, I was at first cautious, but as Karen had remarked, “You have no-where else to go other than brain surgery”!! She was totally spot on. Mainstream medience had failed us completely. Instead, we needed an alternative avenue and deeper dive. After multiple testing, we found out that our daughter was intolerant to a number of foods, and in particular, dairy, and that was causing a number of other problems and in particular, many ear infections. But as she was a baby whenever this developed, how could she tell us of her physical ailments? We took her off dairy, boosted all of the vitamins and minerals she was lacking and then started the LiFT Programme which essentially repaired the damage that had been caused by repeated ear infections, and then more – – something more – – it joined something in her brain together, click, made it all work. The results were immediate. After her first session in the LiFT Programme, she said her first sentence. I was there with my mother whenever it happened and once again, the floodgates opened, but this time for joy. I knew she was going to be ok. She in now in her second year in a highly competitive and academic mainstream school. The teachers have no idea about her start in life but we have been told that she is a very bright little girl and very, very popular in the class. Jack had been diagnosed with a severe global developmental delay. After two weeks of a home listening programme Jack’s mum described how he had changed. “He is more content, he likes walks in his buggy again, sings or chats along, likes drive in the car as well and generally he’s chatty most of the day. He is babbling again, mama, baba, sometimes he tries to imitate words when I emphasize some word. He sleeps well through the night, last few nights he hasn’t woke up at all during night. He started drinking for longer, previously I would stop him after 2-3 sips, but now he holds my hand when I hold the beaker and controls how many sips he has, and it could be 5-7. On iPad he started playing his puzzles and matching apps again. He is managing to stand up against the coffee table by himself, if he is well positioned. From being on tummy he is managing get himself into all 4, by pulling the knees towards his tummy. He started doing side walk beside coffee table, just like that, and myself and physio have been trying to make him do it without success for the last few months. Finally as you could see on the video, he started crawling. I am not sure if you have expected to see all that after 2 weeks, we certainly haven’t and we are over the moon. Note also that in the 2nd week of the Listening Therapy with bone conduction headsets, we have started doing the Bio-med gut programme, which means that he was taking some antibiotics and anti-fungals, to kill off bad things in his gut. We are finished with antibiotics today, and still have few more anti-fungals, and after that we are back to usual supplements on clean gut. Maybe we could give small credit to the gut programme, but we believe that most of the success is thanks to the Listening Therapy. Shea is an 8 year old boy who was diagnosed with autism. His Dad thanks The Child Development Centre for the positive social change they’ve encouraged in his son. “Just wishing you and everybody a merry Christmas and happy new year and to say Shea is getting on great, a massive difference in all areas. He is so much more alert and happy and actually telling us what’s going on at school and that he used to be ready for school himself at about half 8 which was good but now he has breakfast and himself ready for just after 8. He has more homework now and he is coping great with it, He used to wait until I came home from work but now he starts it in kitchen when he comes home and if he needs help with anything he will ask his mum. Eoin is a 5 year old boy who was diagnosed with Verbal Dyspraxia. 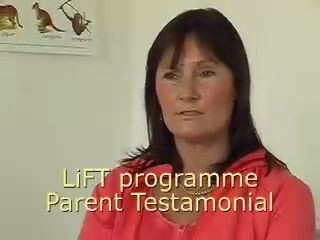 The difference in Daniel after his first intensive LiFT session was huge, as Daniel’s mother explains below. “In 2013, we did our first intensive session (The LiFT) with Karen and The Child Development Centre in Galway. Straight away I saw a change. When I called my son, he would now stop, turn around and acknowledge me. He might not do what was asked but he now heard. Since then, we have done subsequent boosts with Karen. Each time our son progressed showing noticeable signs of improvement. Sophie’s parents discuss the therapies Sophie underwent at The Child Development Centre and the support they and Sophie received throughout. “Karen O’Connor and her team at The Child Development Centre have worked with our daughter for the past year, helping her with her speech & language difficulties, using a combination of speech & language therapy approaches and sensory integrative techniques particularly sound-therapy. We will be forever grateful to everyone at the Clinic particularly Karen who helped us on this truly remarkable journey. Conor was diagnosed with ASD at the 2.5 years old. Conor’s mum discusses the changes sessions with Karen have brought, following a number of failed efforts elsewhere. “As well as using Speech Therapy and OT techniques, Karen’s focus on listening therapy and biomedical interventions made sense to us as parents of a child with ASD. Karen was very honest with us about Conor’s potential and set realistic goals for him. While initially the intensity of the programmes felt at times overwhelming, Karen’s belief in his potential and her availability to provide support to us has given us the confidence to fully commit to her recommendations. 6 year old who no longer has a diagnosis of Speech & Language Disorder (now referred to as Developmental Language Disorder). “Our son had been attending regular speech & language therapy for two years but he didn’t make any progress until he started music therapy! Mark is a 6 year old boy who had been diagnosed with ASD.